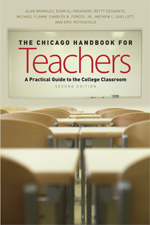 Brinkley, A., El-Fakahany, E., Dessants, B., Flamm, M., Forcey, C.B., Ouellett, M.L., Rothschild, E. The Chicago Handbook for Teachers: A Practical Guide to the College Classroom, 2nd Ed. Chicago: The University of Chicago Press, 2011. This “how to” book must receive mixed reviews. The “basics” of effective teaching don’t change—thank heavens!—so any book that lays them out, as this one does, will be useful for beginning teachers in particular. The authors clearly and coherently discuss key topics such as preparing for class; the first weeks; lecturing; student writing and research (with a good discussion of academic dishonesty and how to prevent it and deal with it); testing and evaluation; creating and sustaining an inclusive classroom; and using electronic resources for teaching. Their chapter on active and collaborative learning is less useful because they do not adequately address the implementation of effective group work, a shortcoming reflected also in their suggestions for further reading. The authors have included chapters on topics not always addressed in “how-to-teach” books. I found the chapter on “Teaching Science: Challenges and Approaches” particularly helpful because this is a key concern at major research universities. The discussion of various lab types (demonstration, hands-on; open, inquiry-based) was illuminating. They also address teaching as a part-time instructor, a highly relevant topic as they note, given the fact that almost half of all college and university classes are taught by contingent faculty. This chapter also provides advice for graduate teaching assistants. The chapter on “Evaluating Your Teaching” was a welcome addition to a “how-to-teach” book, although it did not explore options in depth. Linda Nilson’s Teaching at Its Best: A Research-Based Resource for College Instructors most closely parallels this one. I recommend the Nilson book because of its greater depth and more exacting scholarship. Great informative site. I'm really impressed after reading this blog post. I really appreciate the time and effort you Look here spend to share this with us! I do hope to read more updates from you. Teacher to be more difficult as a lot of nerves and emotions out on children. Blogs are www.masterpapers.com so interactive where we get lots of informative on any topics...... nice job keep it up !! Cool handbook ! http://online-essay-writer.org/ I'd like to read it! I like this handbook. http://online-essay-writer.org/ Thank you for the review. The city of Chicago is gaining teachers to work in full-time employment. I'd like to thank you for sharing such useful information. http://www.online-essay-writer.org/ It is nice of you to share. thank you for the post. http://online-essay-writer.org/ Thank you again. Department study is the most convenient.